The TWiVsters review isolation of a naturally occurring DNA virus from fruit flies, and the cell-type specific function of a small transmembrane protein encoded in an open reading frame upstream of the enterovirus polyprotein. The TWiVerinos discuss Nipah virus and the recent outbreak in India, and the first cast of polio in Papua New Guinea in 18 years. At Europic 2018, a meeting on picornaviruses in the Netherlands, Vincent speaks with Sasha Gorbalenya, Jim Hogle, Ann Palmenberg and Frank van Kuppeveld about their careers and their research. Vincent and the Virals review undermining of antiviral effectiveness by genital inflammation, and heterogeneity of influenza virus infection in single cells. The TWiV team reviews the first FDA approved gene therapy, accidental exposure to poliovirus type 2 in a manufacturing plant, and production of a candidate poliovirus vaccine in plants. 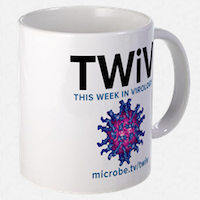 The TWiVome discuss the blood virome of 8,420 humans, and thoroughly geek out on a paper about the number of parental viruses in a plaque. The TWiVaniellos discuss a thermostable poliovirus empty capsid vaccine, and two cell genes that act as a switch between entry and clearance of picornavirus infection. Vincent speaks with Julius about his long career in virology, including his crucial work as part of the team at the University of Pittsburgh that developed the Salk inactivated poliovirus vaccine.